We are delighted to announce that AFD China Intellectual Property Law Office is the external representative appointed in the largest number of PCT applications from 2016 to 2017. On September 12, 2018, the World Intellectual Property Organization (WIPO) issued the Patent Cooperation Treaty Yearly Review 2018. A list of the top 50 external PCT applicant representative from 2016-2017 is included. AFD China ranks number one in this list with 3256 PCT applications published. It is the clients’ trust as well as the effort of all of our staff that make us achieve this good result. Taking this opportunity, we sincerely thank you for your support. Moving forward, AFD China will keep on providing comprehensive and satisfactory IP service with full enthusiasm and professional attitude to all of our clients. 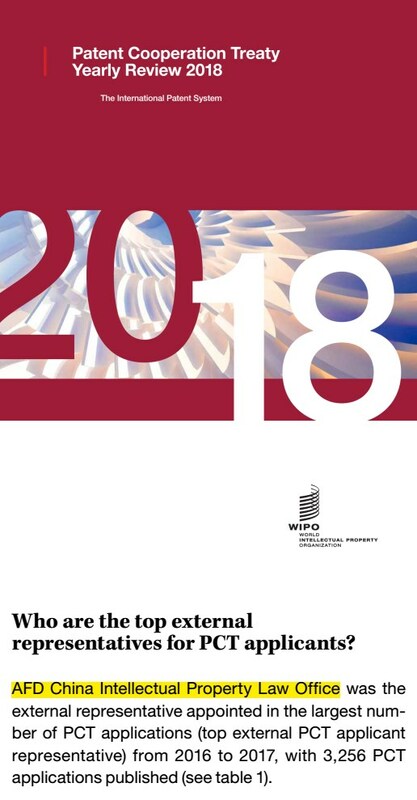 In the Patent Cooperation Treaty Yearly Review 2018, WIPO also discloses the statistics on global PCT filings. It shows that the number of PCT application received by CNIPA ranks number two in the world, and three Chinese enterprises are among the top 10 enterprises in terms of the number of PCT filings. It can be seen that Chinese enterprises gradually attach importance to IP protection and are more and more willing to go abroad and establish their global strategic planning of IP rights. Chinese IP environment cannot flourish without the enlightened national policy and the hard work of each IP practitioners. As an IP agency, AFD China will keep on improving ourselves and strive to contribute to the development of China’s IP industry.